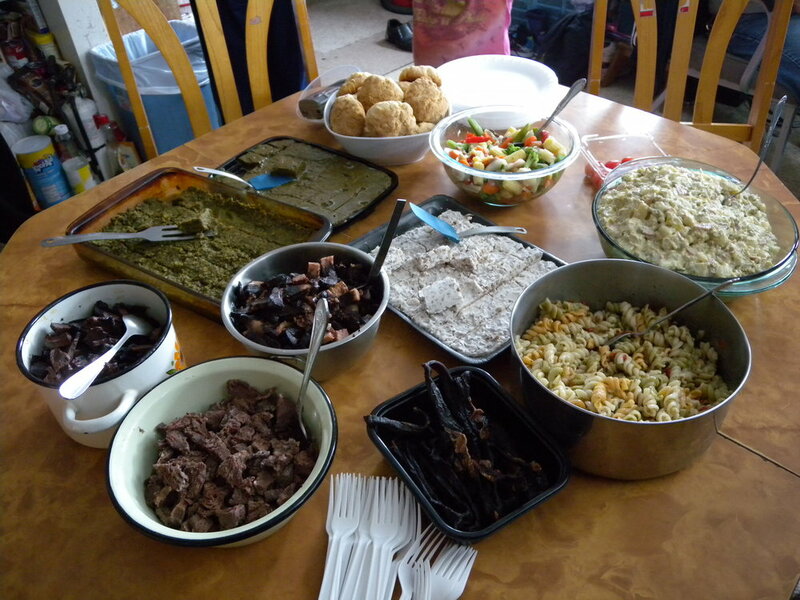 That’s what cultural anthropologist Sveta Yamin-Pasternak (University of Alaska Fairbanks) is exploring in her work on food and cuisine in the Bering Strait region. She aims to identify and explore the complex connections between smell, taste, and cultural programming. To accomplish this, NSF-funded scientist Yamin-Pasternak visits Chukotkan and Alaskan communities at different times of year to observe both celebrations and every day meals. Since 2001 she has been welcomed by many host families who allow her to participate in their food rituals while she observes social dynamics – what people are eating, who is present at meals, who is served first, and what types of tools people are using in their kitchens. By looking at the cultural landscape and how traditional fermented foods are integrated in that landscape, Yamin-Pasternak hopes to understand more about the cultural role of food. “I became interested in this question while doing research in the Bering Strait area. I asked people what they were eating and how it was different from their youth. For many people it was very different. Getting used to traditional foods again has been challenging for many people. I wondered is it possible for us to learn to love any food or is it something deeply engrained in us from a very young age?” says Yamin-Pasternak. 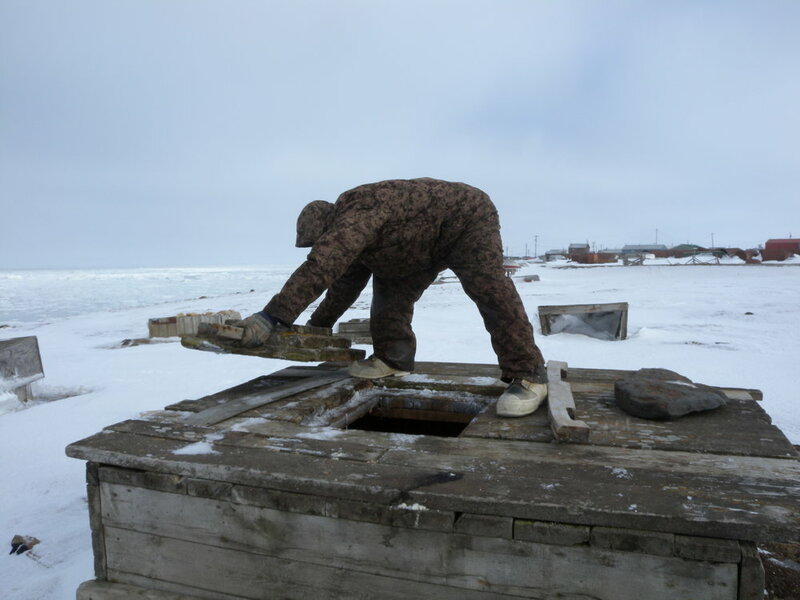 For many generations, natives of Chukotka, a peninsula on the northeastern coast of Russia, and of western Alaska, included partly decomposed foods, mainly meats, in their diet. But in the mid-twentieth century, many native young people lived in government-run secondary boarding schools where they cultivated a taste for the Euro-American or Slavic-Russian foods offered. 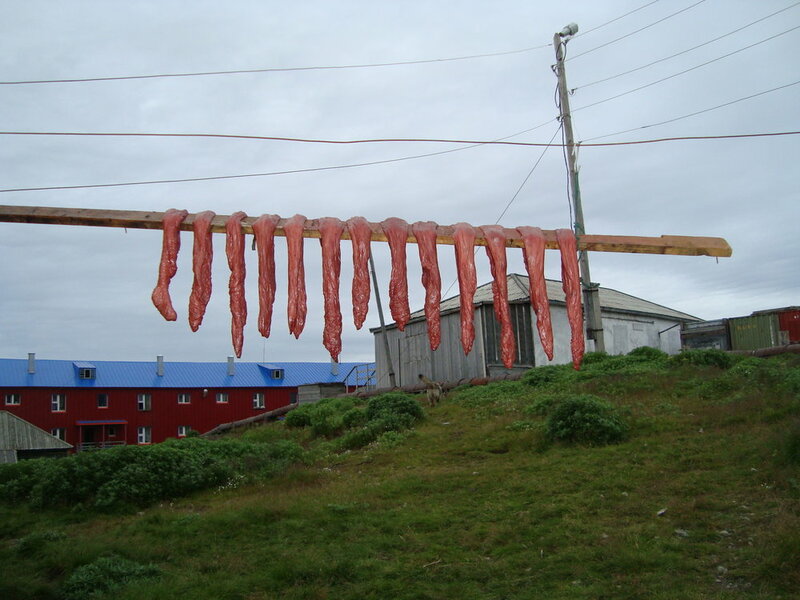 Traditional food includes dried walrus stomachs, pictured here. Traditionally, communities stored food through fermentation, drying, and in ice cellars like the one pictured here. The challenge, Yamin-Pasternak says, is for people to learn to like foods traditional to their culture, but not ones they were brought up on. Fermentation generally refers to the process by which yeast turns sugars into acid, gas, and alcohol, but Yamin-Pasternak’s definition is more inclusive. Unlike the traditional definition, hers includes a wide range of traditional foods that change from one thing to another in a variety of ways. “In my work, I stretch the definition to include the processes by which microorganisms, sometimes natural and sometimes introduced, change one product into another. This is accomplished through the release of enzymes and the subsequent destruction of cells. In short, the meat rots,” says Yamin-Pasternak. 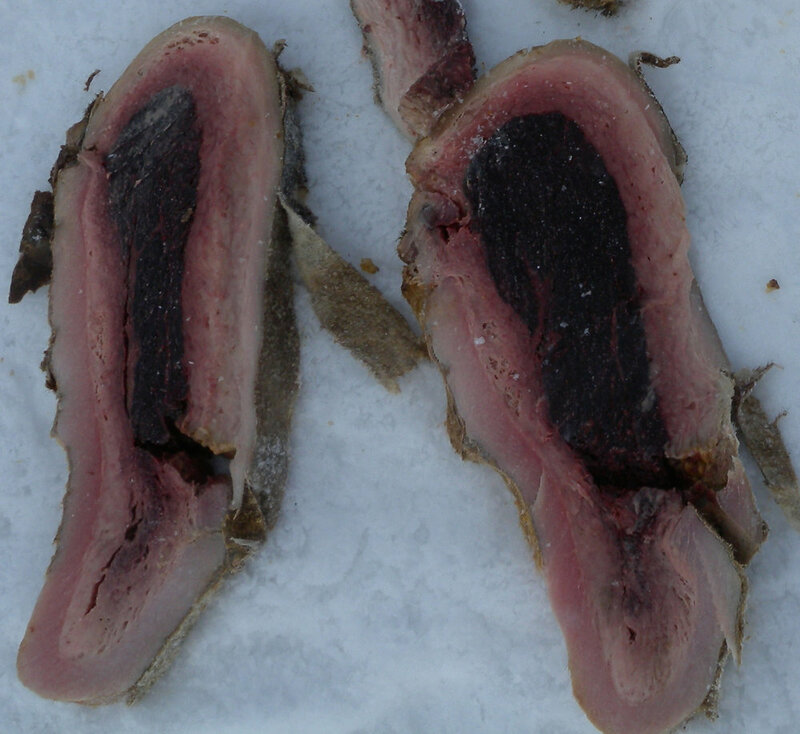 These traditional foods are produced using many types of marine mammals, birds, and terrestrial animals such as caribou. Such animals form the cornerstone of year-round food reserves. There are many methods and recipes that differ by community and family. Both men and women take part in food preparation. Meat is deboned and then packed tightly into a cocoon of the animal’s own skin. The package is then stretched to allow for air circulation. Some meat is aged in the house for only a few days, but some is left in pits during late summer while the ground is reasonably soft. Many recipes rely on early fall weather with light freeze-up and thaw cycles. Some meats are left for six months or more. Products have different names depending on their stage of fermentation - early, middle, and final stages. Families may slice off a piece of the meat for the day’s meal, then leave the rest in the cellar to age further until it is “ready” for another meal. 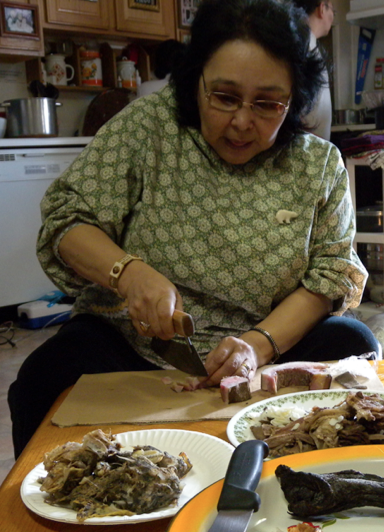 A native woman prepares a meal of fish and walrus in 2011. The really interesting thing to Yamin-Pasternak is that eating fermented food is accepted, even encouraged, by some cultures, where others wouldn’t dream of eating such foods. Even in today’s native communities, traditional foods are not completely accepted. In contemporary society people sometimes wear gloves when they handle traditional foods if they have to go out afterward. The smell can be so strong, it can linger on their hands, and the odor may not be socially acceptable at work, for example. Originally from Belarus, Yamin-Pasternak admits that, although she grew up eating pungent foods like herring, the native fermented foods of eastern Russia and Alaska are a challenge to her tastebuds. Can she learn to love these foods?